mairuru: We got married !!!! Yesterday, we got married (* v *)!!!! I chose yesterday because it seemed easy to remember the date, 2010/02/10. I and my husband (!!!!) are not so good at remembering anniversary. For the marriage registration, we need two person's sign so we went to ask it for our friends couple. Our friend's wife and I are pregnant so men made us our dinner (* v *)! 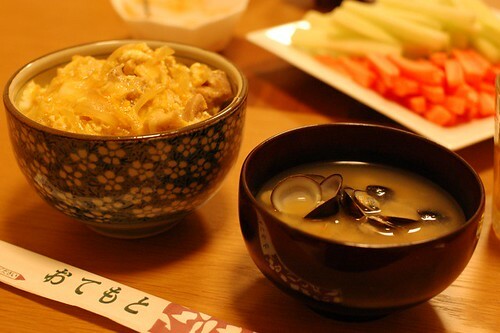 The dinner was my husband's specialty, Oyako-don. We enjoyed them very much (* v *)!!!! I gave them my bibs for their baby what I wrote in my previous post. 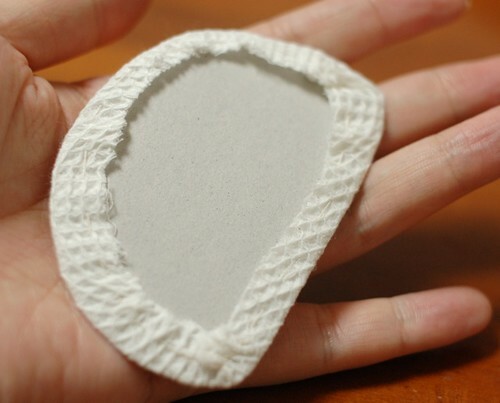 Today I'd like to write here how I made the bibs. 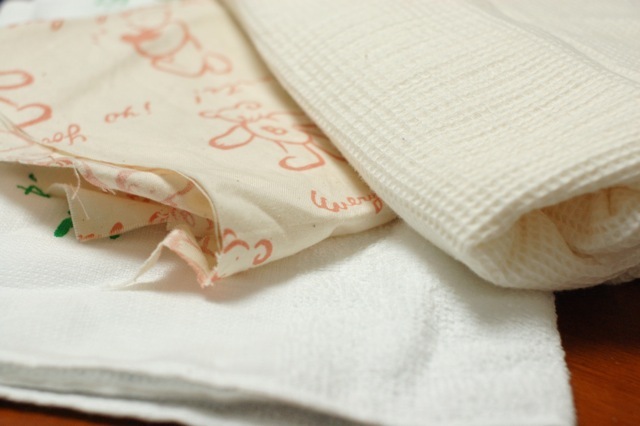 I used these fabrics for them, cotton printed fabric for the right side, cotton soft waffle fabric for the wrong side and cotton towel for the inside. The towel is for well absorbed. I piled them like the picture. And made the face parts using the pattern(I used thick paper). 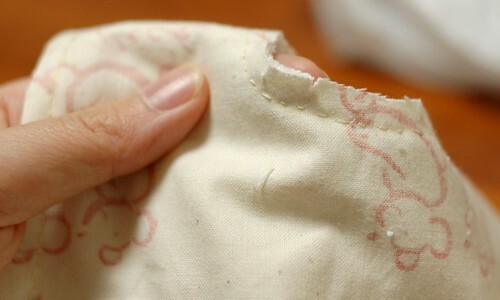 After I put the face on the front fabric, I stitched the face with Sashiko thread. After I finished the face, I piled the towel, waffle cotton and front fabric on it. 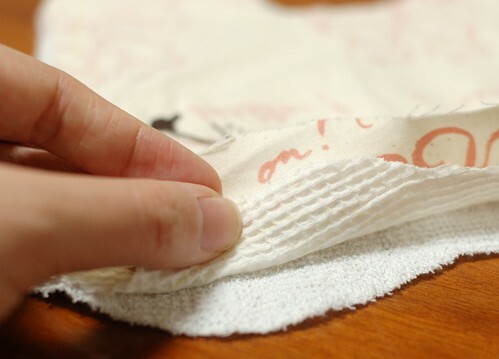 Be sure to face the right side inside of the top two fabrics. 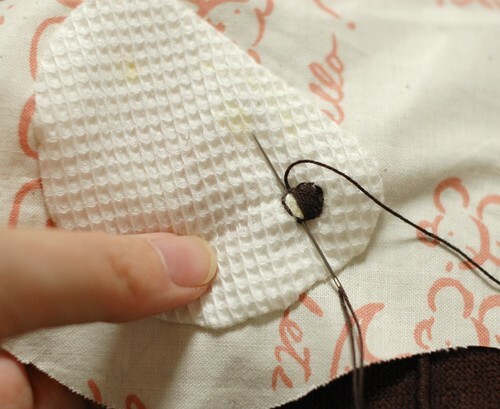 Then sew them together leaving a space to turn it out. I used half back stitch to make it sturdy. And before you turn it out, please cut the allowances of every curve like the picture. It's important. Everyday, I saw the news of heavy snow around the world and am afraid of it. Here it snowed only once and only a little. I hope you all are doing well. Congratulations! I'm so happy for you! I love your blog and enjoy seeing all of your gorgeous creations! CONGRATULATIONS Mai!! It's a very beautiful date 2010 2010. You baby will be born in the year of the Tiger. Yay! What happy and exciting news! Happy wishes on your wedding!! I think that the bibs you have made are full of charm. Your husband made a very cute design of the sloth, and your sewing, and also the rabbit bib is inspiring me to make some bibs for my friends who are having babies soon. Your little "tomato" has two very creative parents!! May you have a long and happy marriage!!! Congratulations all the way from New Zealand! Omedetouu! Congratulations. I love the bibs you made, and the picture of the food made me so hungry! Congratulations from Spain! I wish you all the best for your new family! Congratulations! I am very happy for you, and wish you all the best for your future together. congrats & all the best! Congratulations all the way from Germany! I wish you all the best together!!! Omedeto----!! Have a long and happy one!! 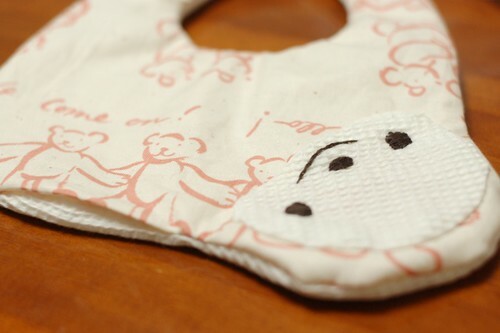 Thanks for sharing such exciting news (and the bib tutorial, too)! CONGRATULATIONS!! I'm really happy for that news.Happy for you :)Wish you to get all happiness together. Congratulations Mai! And thanks for the tutorial, I just learned that my oldest sister is pregnant. Hope I could find some fabrics to make a big for my new niece/nephew. Congratulation , this such a gigantic news !! I feel as if I want to hug you . wishing you both lots of happiness and a long life together ! Congratulations on your marriage I am sure you will have many years of happiness together. We have been nearly buried under a blanket of cold, white, heavy snow the past few days, but my heart is warm, now, upon hearing your lovely news! Congratulations to you both. I wish you health and joy and love and happiness, always. I'm so happy for you, my congratulations! Congratulations and best wishes for a long and happy life together! I assume you mean 'paper' married? will you have a ceremony at a later date? We don't have a plan of the ceremony. I'm content with the paper (* v *). Congratulations!! Have a life of hapiness and love. Congratulations!! I am so happy for you and your Husband!!! I wish you a very happy life together, and soon with your little tomato as well! Congratulations! I wish you a long and happy marriage. Wishing all the best for your new little family!!! Congratulations on your wedding and this year really celebrate Valentine's Day (the day of lovers) with triple happiness. Greetings from Spain. Felicidades por tu boda y este año seguro que celebras san valentin (el dia de los enamorados) con triple felicidad. Saludos desde españa. WOW! Congratulations, what great news! congratulation, Mai!!!! long life together and mooooreeee love!!! I have been following your blog recently and enjoyed it so much reading it! Congratulations on your marriage. I am very happy for you. Greeting from Germany! May you have a wonderful marriage. Congratulations! I'm new here, but I wish you,your husband and your baby the best! Congratulations!! What a happy time for you!!!! Congratulations Mai! From snowy Boston. Your blog is making me so happy these days. It's wonderful to hear about such joyous times. Thank you for sharing them with us! That is wonderful! I am so happy for you! What an amazing year you get to me a wife and a mother all in the same year. Congratulations. All the best for both and for the baby!!! Congratulations - what a year, first a baby and then getting married! Phew it's all happening! Glad you're back on the blog - we miss you. Hope you have stopped feeling sick. I wish you and your husband all the best in your life together! !A very special year for you! And also thank you for taking the time to explain how you did Tomatoes first present! I hope we will hear soon from you again, what news could you possibly give us next time. Congratulations on your wedding - and yes, you picked a great anniversary date! May you have a lifetime of happiness (and more children!). Oh happy day. Congrats on your marriage and baby. My DD#2 also just got married and is expecting in July ... we are all so very excited. Isn't saying "My Husband" a fun thing?!?!?! I remember those days...8-) Have a wonderful Valentine's day. Give tomato a little pat for me! With Love for your happiness! Congratulations!! :) I wish you a ver happy life together! 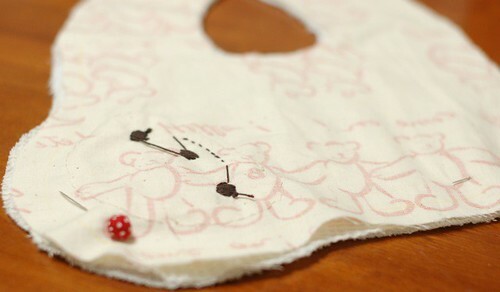 Thank you for sharing the tutorial for the bibs, I'm sure to try and make some next time a little baby appears around me. It's snowy here in Philadelphia but we're fine! Congratulations from Baltimore, Maryland! :):):) We're one of the places that got a lot of snow--but don't worry, we're digging out of it pretty well :) I wish you and your growing family every happiness! Best wishes for a long and happy life together!! Oh! Big congratulations Mai! That is wonderful news - what an amazing year for you so far! Congratulations on your marriage all the way from Massachusetts! Congratulations for your marriage and for yur baby, Iwish you all the best! Congratulations! 2010 will definitely be a full year for you, with your wedding and little Tomato on the way. Best wishes of happiness! hugs and best wishes from Brazil! Hello Mairu, congratulations. I've been following your blog for a while now. Very happy for you to hear about your pregnancy and now you're married! Congratulations from Australia! Sending warm wishes your way for a marriage filled with happiness and love. Aww, aww, aww!!! Congratulations to both of you! That is so exciting!!! Congratulations on your marriage and baby! congrats, that's also my mom's birthday! Congratulations Mai! I wish you and your husband a happy life together! I love the date of your wedding day, it will bring a lot of luck!!! Wow! Congratulations! I am so delighted for you! What a wonderful year 2010 is turning out to be! Good for you! Ome, Mai & Mr. Mai! Best wishes to you! I'm so happy for you! Very happy for you and your husband for this double happiness with your marriage and baby on the way! All the best to the both of you for a happy life together! I follow you from the Midwestern US (on Lake Michigan) and we had about 14" of snow this week. Congratulations!!! Best wishes from Mexico!! Congratulations from British Columbia! That is so exciting. I wish the three of you every happiness. Your "tomato" is very lucky. Congratulations!!!! Great news, a baby and a marriage! What an exciting time! Dearest friend Mai, congratulations!!!! This is really such great news, a baby and a marriage! Exciting time. :) Have a lovely merry happy weekend and a sweet sweet valentine's! Love to yoU! hooray! congratulations to you both! what a lovely post! Congratulations on your marriage. And I consider it a very good sign that your new husband cooks for you. : ) Best wishes for your future together. Congratulations to you both Wonderful news I hope that you will both be very happy...lovely bibs...are you going to make the baby a quilt?? Congratulations on your marriage Mai. It is a good news. Congratulations to you both! This is wonderful news and I wish you much happiness! Thanks for the tutorial. Your bibs are adorable and I suspect many babies around the world will soon be wearing them. Congrats! Wish you two a life long happiness together! Yahoo wonderful news Mai. All the best to you .... will be checking in often for news. Congratulations! May you have a long, happy and blessed marriage! Congratulations to you and your husband. I am so happy for you both. May you have a long and happy life together. I love the bibs. Your baby is going to be the sweetest dressed baby ever. Lots of smiles here for you. So many wonderful things happening for you now! Congratulations on your wedding! Wishing you the utmost joy and happiness in your path together! Felicidades! Congratulations all the way from Mexico. May you have a long and blessed marriage! Wow! Congratulations and much happiness to you! Congratulations on getting married. Hope you will have a long and happy marriage! Congratulations!!!! This is such happy news to see in my blog reader this morning!! HUGE congratulations from the UK !! Congratulations! I hope you have a long and very happy life together. Greetings from Germany! Congratulation!!! Best wishes for you, your husband and your future baby!! Oh Congratulations!! Very happy for you both (and little Tomatoe) - 2010 will be a year you'll never forget! Sorry, I'm late, but congratulations!! congratulations Mai, best wishes for your family! Your blog gives me a lot of illuminations, especially sheding light on how I should preceed my job. I very appreciate your help!